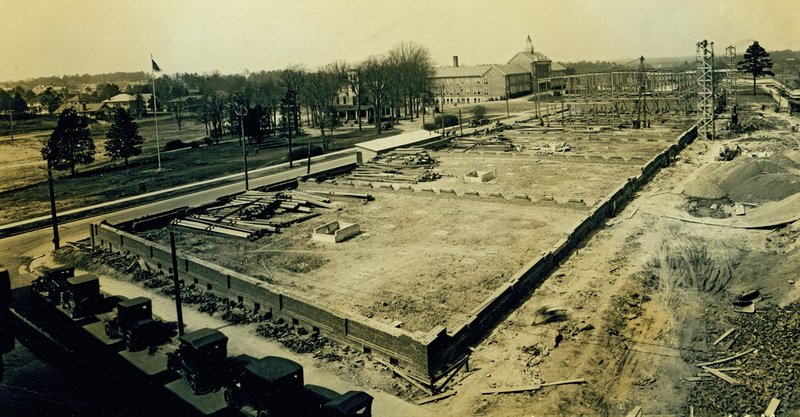 Carmichael Warehouse under construction in 1926, shot from the top of the Hicks warehouse looking northwest. 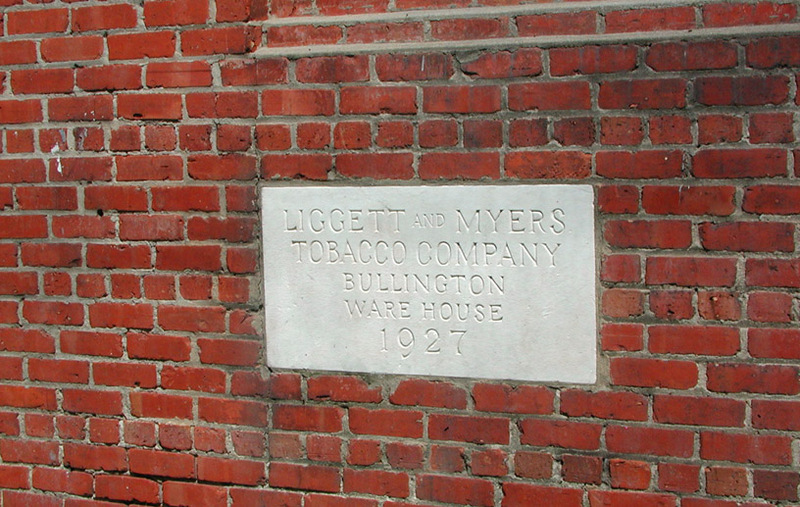 The Carmichael, Bullington, and White warehouses, extending generally north-south along Duke St. were built by Liggett and Myers in 1926-27 for much the same purpose as the previous warehouses (such as the Toms and Hicks to the south) - the storage and drying of tobacco. The Carmichael and White were completed in 1926 and the Bullington in 1927. Unlike the earlier warehouses, these, although brick and possessing some echoes of the earlier warehouses, are significantly less detailed. 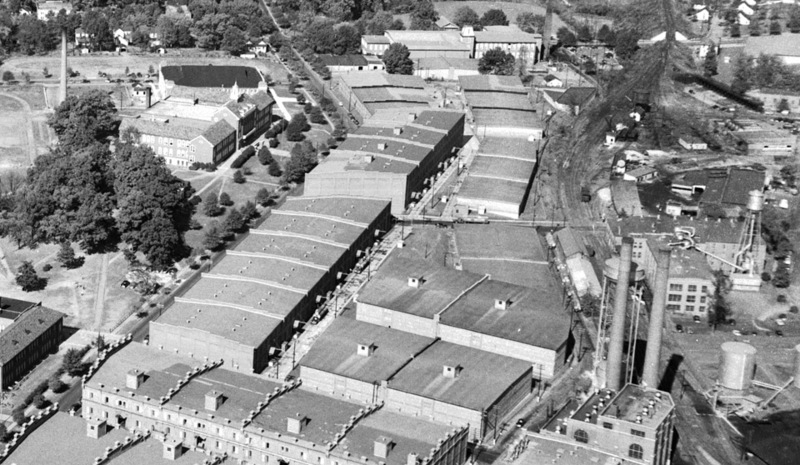 Some of this loss of detail was functional - these warehouses had louvered ventilation windows on the sides of the warehouse as opposed to the ventilator chimneys on the Toms and Hicks, Watts and Yuille, etc. 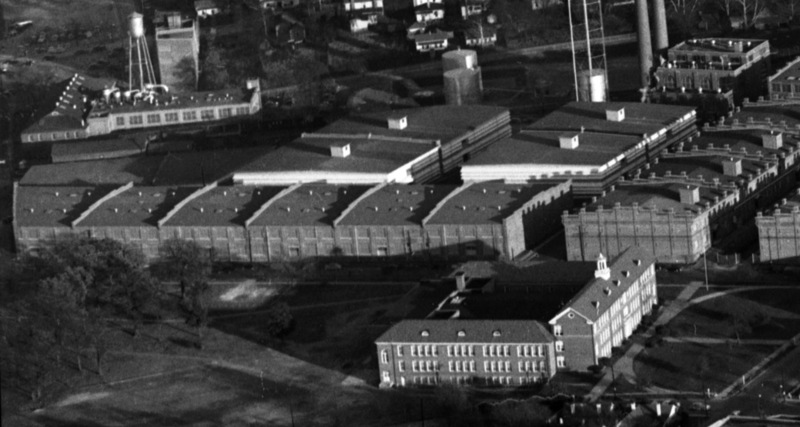 Looking east, 1948 - the Carmichael warehouse to the left versus the Toms and Hicks to the right. Looking north, up N. Duke St. at the 3 warehouses along the roadway - also note the loading arms above the individual bays on the east side of the warehouses. Around 1982, the Bullington was converted to condominiums. The Carmichael was converted to office use, currently occupied by Durham County Social Services, and the White to office suites. The Bullington is perhaps most intriguing as one of the earliest efforts to rekindle residential life anywhere near downtown through historic renovation of earlier commercial structures. Although it seems that it was quite successful, from what I've been able to tell, it oddly was not repeated in any substantive way - it took a good 18 years for additional significant residential development to occur downtown. The entrance to the Bullington, on the east side of the building, 05.25.08.